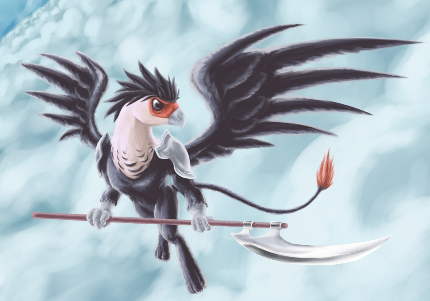 Your griffon character has several abilities that come as part of being one of the griffons. Ability Score Increase. Your Strength score increases by 2, and your Wisdom score increases by 1. Age. Griffons are somewhat longer lived than many of the other everglow races. They reach maturity at age 20, at which time they are likely to begin striking out on their own. Alignment. Though relatively few griffons are good aligned, they tend towards more self serving and neutral alignments. Speed. Your base walking speed is 30 feet (20 feet bipedal). Languages. You can speak, read, and write Common. You can also choose one language from the following list: Sylvan, Auran, Elven, or Gnomish. Fey Born. Griffons count as fey for all purposes. Four Legged. Being a four legged creature, you can bear greater weights (up to 50%) than a human of the same strength without being encumbered. Any roll to avoid becoming prone is made with advantage. Flight. You have feathered wings, and your base flying speed is 40 feet. You cannot fly if you are wearing armor you are not proficient in, armor not tailored to accommodate your wings, or a backpack not specially tailored to your wings. While flying, you have disadvantage on strength checks to interact with objects that are on the ground. You fall to the ground at the end of your turn unless you move at least half your flying speed during your turn. Beak. You gain a natural attack with your beak, it has the finesse property, and deals 1d6 piercing damage. Cloud Walker. You can treat fog, mist, or any cloud as solid. Your affinity to the air reflects in the way you move and the magic you sling, bringing on the fury and kindness of the skies to others. When casting a spell that grants or denies flight or directly manipulates wind or electricity, you may, as a bonus action, enhance the spell as if you had cast it using a slot of one level higher without using that increased slot, up to a maximum slot you are normally capable of casting. When making an ability check related to an aerial stunt or resisting wind, you may double your proficiency bonus if you were already proficient. Your claws, while sharp naturally, have been honed into true weapons fit for making anyone fearful to face you in martial combat. Your unarmed strikes deal 1d6 piercing or slashing damage. You gain a +1 to attack and damage with unarmed strikes. At level 5, your unarmed strike counts as magic. At level 10, your damage increases to 1d8 with your unarmed strikes. Ponyfinder: Dawn of the Fifth Age © 2015, Silver Games, LLC; Authors: David Silver.